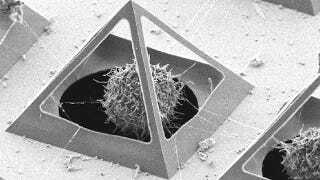 This photograph may look like an artifact from an alien world (one with similar taste in architecture to the Egyptians), but it actual depicts a cell living in a pyramid-shaped cage, one that helps us view cells in something closer to their natural environment. One of the problems with studying cells in a petri dish is that you're viewing them in a flat environment rather than in something resembling three-dimensional tissue. This technique, known as corner lithography, allows researchers to study cells in a controlled environment while coming closer to mimicking tissue. Researchers from the University of Twente in the Netherlands created these cages by placing nitrides over silicon pits and then peeling away most of the material. Some of the material remains in the corners, forming a pyramid. Since the pyramids are open at the sides and are sufficiently close to one another, the cells are still able to interact for the most part as they normally would, unaware of and unimpeded by their cages. Now we just need to wait for someone to make a commemorative corner lithography D4. You can read more about the process in the August 21st issue of Small. Photo from the University of Twente.